NiceHash has been in the cryptocurrency business for three years, offering a huge marketplace for people interested in buying or selling hashpower. The company presents a unique opportunity for individuals to "rent out" their mining rigs and hashing power or purchase massive amounts of hashpower, point it to a pool of their choice, and start mining one of the numerous coins supported. The purpose of our comprehensive NiceHash review is to introduce you to the details of this company’s offer, so you could determine whether it’s suitable for you and how it can boost your cryptocurrency efforts. NiceHash was founded in April 2014 and has been offering services for cryptocurrency miners, traders, and investors since. In just three years, NiceHash has become one of the largest hashpower marketplaces in the world of cryptocurrency. NiceHash currently provides one of the widest selections of algorithms for mining different cryptocoins (currently 23). With over 3 million served orders and more than 80.000 BTC paid out to its customers, NiceHash has gained the trust of thousands upon thousands of users. The company’s statistics show that more than 85.000 NiceHash miner users are active every day while the number of daily active workers goes over 170.000. NiceHash utilizes cutting-edge infrastructure and technologies, such as CloudFlare acceleration and protection, as well as insured and secure BitGo BTC deposit wallets. As we already mentioned in this NiceHash review, NiceHas caters for both buyers and sellers of hashing power, which significantly widens its scope of potential users. Buyers can start placing hashpower orders right after the initial registration process. NiceHash only requests your email and a password for registration, after which you need to deposit at least 0.01 BTC to your NiceHash wallet before placing an order. Every buyer can choose the cryptocurrency they want to mine. NiceHash supports 23 different algorithms, including SHA-256, X11, X13, Scrypt, Equihash, etc., which you can use to mine the corresponding cryptocurrencies. You can also choose the pool you want to use for mining. After you determine the details of your future cloud mining quest, you can go to the marketplace and place your order. You can opt for the US or EU marketplace and define the maximum price you’re ready to pay for processing power. All prices are expressed in Bitcoin, regardless of the cryptocurrency you want to mine. With NiceHash, you neither have to subscribe to its service nor pay for anything in advance. Your deposited BTC is spent as you mine, so if there’s anything left in your NiceHash wallet after the mining is finished, you can keep the coins in your wallet or withdraw them. When it comes to selling, NiceHash enables sellers to offer their mining rigs and sell computing power. You can rent your computer, GPU mining rig, ASIC machine or rig farm and earn Bitcoin with every share. NiceHash allows you to select the algorithm you want to use for mining and choose one of the offered locations. NiceHash operates servers located in Amsterdam, San Jose, Hong Kong, Chennai, Tokyo, and Sao Paulo. The company recommends opting for a location nearest to you because it can improve the performance of your mining rig. NiceHash isn’t your typical cloud mining service. Buying hashpower from NiceHash doesn’t require signing a contract. 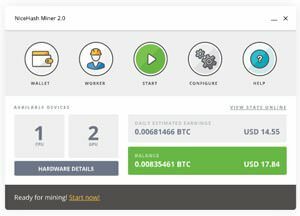 All you have to do is place an order for the coins you want to mine and the pool you want to use for mining. You can select any pool you like, even choosing to connect to P2Pool nodes. You can use the pool verificator that’s available on the NiceHash website to check whether the pool of your choice fits the basic requirements. Moreover, NiceHash allows you to buy as much hashrate as you like. You can tailor your order as you see fit. You can change the price you’re ready to pay, the amount of hashpower you want to buy or the limits of your mining anytime you want. NiceHash implements state-of-the-art algorithms on its Stratum engine in order to ensure the pool’s stability and validity. Therefore, sellers are paid for 100% of the hashpower their rigs produce and the buyers will get 100% valid work submitted to their chosen pools. The service supports all mining pools following the stratum protocol specifications. If your pool is constantly dropping connection or feeling unstable, you might be dealing with dead pools. This is not inherently a problem since you only pay for the shares received. NiceHash requires a minimum pool diff of 8 and xnonce2 size 3 and more. This is implemented in order to avoid fake pools and various attacks. It’ll take up to 30 seconds for your order to go live, so bear that in mind when submitting orders. Buyers can edit their orders by either increasing the price or, optionally, limiting hashing power (or altering the already existing limitation). They can also refill their existing orders, extending their running times. Within preset price steps, buyers can also decrease their orders. Canceling the order warrants a Bitcoin refund, which is an excellent way for quickly switching between the different mining algorithms. However, due to order-spamming attacks, 0.0001 BTC is a non-refundable amount during order cancellation. Self-orders are also not allowed. NiceHash supports only the latest miners due to its modern engine, so you should definitely check their software page before trying to rent out your hashing power. For any additional information, you can contact NiceHash customer support via email, search through its well-organized knowledgebase or request personal support if you’re a registered customer. As we’ve already mentioned in this NiceHash review, there aren’t any fixed subscription plans for buyers or sellers. The company’s website features minimal and fixed hashpower prices, as well as those for maximum immediate orders for each algorithm on the live marketplace page. The price list is automatically refreshed every 10 seconds, so buyers who would like to place a standard order can check it out before making their bids. Those who prefer fixed orders can check out the full list of algorithms. These prices don’t change as often as minimal prices. Those who prefer fixed orders can check out the full list of algorithms. These prices don’t change as often as minimal prices. For example, hashpower for Scrypt costs 0.0381/0.0389 BTC/MH/day. Standard bidding – This option allows you to bid as low as possible for a certain amount of hashing power. However, your price might get outbid eventually and you might have to increase it in order to maintain the desired processing speed. Fixed – This option allows you to fix the price of the order and receive guaranteed hashing speed during the order’s lifetime, regardless of the higher bidding prices submitted later on. Needless to say, fixed orders are more expensive than the standard bids. Fixed orders are limited to 50% of the overall hashpower available in order to leave enough room for bids. These orders are limited to 24 hours, after which you’ll have to place another one. 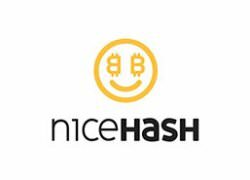 Note that NiceHash only accepts payments in Bitcoin. Although NiceHash doesn’t have typical subscriptions, there are some fees for both sellers and buyers. Buyers pay a non-refundable 0.0001 BTC fee for a new order and a 3% fee for the amounts spent on hashpower orders. Bitcoin withdrawal fees are set to 0.002 BTC or 0.4% (whichever is bigger). Sellers have to pay a 2% fee for payments to their NiceHash wallets, regardless of size. Transactions higher than 0.1 BTC sent to external wallets are charged 3% or 4% if they’re greater than 0.01 BTC. NiceHash is a company that’s been present on the cryptocurrency market since 2014. Since its foundation, NiceHash has been offering numerous opportunities for cryptocurrency miners and individuals looking to sell their hashing power. It provides one of the largest marketplaces where buyers can place their bids or fixed offers and sellers can meet the ordered hashpower requirements. NiceHash isn’t a cloud mining company per se, rather a unique platform with a “from the users, for the users” business approach. Nicehash is the only legit company I’ve used. I place my order, there’s always a suitable miner and I mine whenever and how much I want. Convenient and legit, that’s what I have to say about Nicehash. Good mining, I’ve been with Nicehash for about 5 months and I earn about $90 a month, I think it’s decent. And it’s not a scam like many others.